I love cities. And I love them more when they are big and when they do not sleep at night. Maybe it is my love of nights that make me love cities which never sleep. But the fact is, I love cities. Cities are full of life - schools, offices, markets, hospitals, shops, malls, movies, parks, high speed Internet, opportunities, energy, technology, people, government, facilities, sound, lights, and did I miss nightlife? I love it when all the action is around you. And Delhi is the capital of all action. That is why I love Delhi. This was my second time in Delhi. The last time too when I was in Delhi I loved it, albeit a lot less. This time I was talking to my friend who lives in Delhi as if he came to my city and not the other way round. But I am digressing a lot. I need to write about my trip. And it is about time that I finished the entire series. From this point onwards I might not maintain the chronological order of events in my posts, more because I have begun forgetting details and sequences than because the rest of the journey involves me visiting the same places multiple times with different people. We stopped at NOIDA and stayed at my friend's house where we had nice mutton specialities. Next day morning we took to the metro. Got a ₹150 tourist ticket to travel throughout the day. First stop at Akshardham temple (which did exist the last time I came to Delhi, but I didn't know). This is a huge temple built after AD 2000 with "donations" of a large number of devotees. There was marble and gold all over and the story of Swaminarayan. But, because of a previous bomb blast here, to get inside is a huge task. First, you put your mobile phones, ear phones, non-transparent water bottles, etc in your bag. Then you fill a form with your details. Then one person from the whole group should carry all these inside to the baggage counter where they keep the bags "safe". There, this person is supposed to take out all the mobiles and lay them down to count (which is very stupid because in our group we had a lot of phones and I didn't even know where in the bag the phones were when I went to the counter). After showing your face, etc into the camera you get a metal token number. Now, you can all walk to the body checking counter where you have to remove your belt, wallet, etc which will go through a metal detector kind of thing and then get frisked. All this for walking through some marble. I don't know why, but religion immediately colours my view of magnificent structures in a bad shade of greenish-pink. There are many "dwars" (holes) you have to pass through before reaching the central shrine which has very elaborate designs all around. There is water surrounding these areas. Next to the shrine is a statue of Swaminarayan which hosts the lights and sound show in the night. Near the way out I found the most fascinating thing in the whole place. A very large solar panel that moves with the sun such that it gets the maximum sunlight all day! That thing probably powers the entire place. We also had some snacks in the restaurant at the exit. The toilets here are great too! I did come back to Akshardham a second time a few days later. This time we saw the water show. It was splendid, with laser lights being used (unlike just lights in Amber). The laser allowed showing much more delicate things and even animated videos. From Akshardham two of us had gone to Qutb Minar while the rest went to Sarojini Nagar market for shopping. 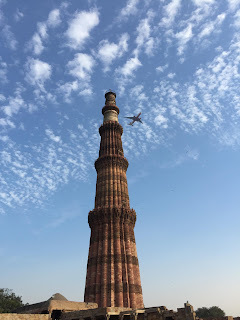 Aeroplanes were constantly trying to hit the Minar and missing it. There was a plaque at the bottom that specified Qutb Minar was shorter than Taj Mahal by 5 feet. We saw the iron pillar that never rusts nearby too. I wanted to send a picture postcard to a friend back in Kerala but couldn't find a post office nearby. We then went to Sarojini Nagar Market where you could buy all things original or all things duplicate as you prefer at costs you decide. We learned bargaining skills, and fell for tricks too. Had nice coffee there. Did a lot of window shopping. Almost got bitten by a dog. Heard a person say "these are stolen items and you get these at unbelievable discounts. No guarantee these will be here tomorrow". Saw so many clothes that you would never buy clothes from anywhere else. That night as I was chatting on my phone my friends came up with a cake singing happy birthday with "Happy Birthday ASD" written on it. I had turned 23. Quite a wonderful birthday this one. Next day I split from this group I was travelling with till now and went to join another set of friends in Delhi, near Jasola Apollo. We had food and by evening went to the Rashtrapati Bhavan. Saw the red soil at Raisina Hill, the canons, etc. up close. Looked at the long Raj Path till India gate choosing not to walk it with our heavy bags. That night we would leave for Uttarakhand, reaching back 5 days later. After returning we had brief visits to Chandini Chowk market, Akshardham (lights & sound show), etc. At Chandini Chowk market we had Dahi Bhalles. But by then, as you will soon learn, our stomachs wouldn't accept most food items. We took the 19'666' Udaipur-Khajuraho express to Agra from Gandhinagar railway station Jaipur. It came right behind the double decker express to Delhi. We took general tickets and later upgraded to sleeper tickets from the train and got allotted the same empty seats we were sleeping in after getting on. Outside Agra Cantonment railway station, there was government approved sightseeing packages with small cabs at ₹750 for half day. We had only one place to visit, actually - the Taj Mahal. Taj is large and Agra is small (like Mysore palace and Mysuru). There are multiple gates to the Taj. We took the one near the red fort. (The red fort of Agra is not the red fort of Delhi as I used to believe. At least, that explains how Shah Jahan could see the Taj Mahal from his prison in red fort where he was put by his son). The crowd of rickshaw riders, camel riders, vendors, guides, and photographers who approach you here is larger than you would expect. We fought our way through to the Taj, yet falling for buying some shoe covers. There is tight security at the entrance. Bags are checked and so are people. The entry ticket was a QR code printed on a rectangular piece of paper. It was scanned at the entrance. Once inside, we got a guide for ₹100 which was cheaper than all the guides outside and also stupid because he didn't "guide" us for more than 10 minutes and also led us into a photographer's ambit. More about that later. There is a row of houses just opposite to the grant entrance gate of Taj Mahal which supposedly belong to the descendants of the sculptors who built the Taj Mahal. The story that Shah Jahan cut the hands of the workers so they wouldn't build another Taj Mahal is most probably a myth. I was imagining how cool their address would be - "House 21, Taj Mahal". The design of Taj Mahal complex is mostly symmetric. For every building on the left, there's a similar building on the right. The Taj Mahal itself looks the same from all four sides. The only asymmetry for us was that when we went, two diagonally opposite minarets were being cleaned because of all the color they've been losing and these were draped in metal stands so the workers could sit on them while scrubbing the white turned yellow marbles with some ancient technology of scientific restoration. The entire Taj seems to have turned as yellow as my teeth and I'm sure the next time I go, it'll be the central dome that is being cleaned like this. There were giant writings on all walls, especially at the darwaza (door). The first look at Taj Mahal from front through this door is quite a moment. The monument is very large, larger than what you would expect from photos. And it just stays there. White. Stone. Just inside there is a large number of photographers telling you how the mobile camera is not as good as their professional camera in capturing both your faces and Taj Mahal's simultaneously. Our guide, at this point, told us the story of how Shah Jahan wanted to build a black Taj behind the white across Yamuna (which is a myth and a fantasy created by a writer later, according to wikipedia) and about how the minarets are inclined by 5 degrees outwards so that in the event of an earthquake they won't fall on the dome, and then he led us to a photographer who would waste our time and vice versa. First, he tells ₹25 per photo. Then he tells, only hard copies. What would one do with printouts? He said he can give soft copies too. We took so many photos. Then we chose 4 photos and he said he can't "waste" a CD for just 4 photos. So we chose to get hard copy of just one group photo and then he got so angry and deleted all the photos he took. I had started walking towards the Taj with one of my friends while this drama was happening because after all, people enjoyed Taj even before photography was invented. There is a long and narrow garden and pool in front of Taj which is well maintained. At just about the right spot for photographs there is an elevated platform. When you walk right from right below the Taj, you reach the free shoe racks to keep your shoes. We turned in all our shoes. Even those of us who had shoe covers. For a moment we thought the shoe cover is a shoe made of cloth to be worn on naked foot, but just as we moved away from the racks we saw others wearing the shoe cover over their shoes. I was walking barefoot anyhow, because I wanted to feel the marble. All of us walked barefoot. There are two paths everywhere. One for general tickets, one for VIP tickets. I assume the VIPs are those foreigners who are forced to pay ₹500 and above. The general entrance is towards the right again. We get to enter the Taj from behind. There are two buildings just flanking the minarets. One of these is a mosque. Among the other buildings in the complex is a VIP guest house where ministers and others can stay when they come to Agra. The marble was cold even though it was around noon when the skin of our feet touched it. Like I said, the general ticket holders enter via the backside and so we saw the Yamuna first. The river flows parallel to the backside of the Taj. There is a garden on the exact opposite bank and nobody can be blamed for thinking Shah Jahan wanted to build a black Taj Mahal for himself there. Once you climb on the platform where the minarets are, you can no longer see the dome and therefore the Taj Mahal becomes so unlike what you know from all the pictures. The symmetry of the construction is mathematical. Yet there is an entrance at the front wall, the marble sides of which are carved with flowers and other designs. The entrance directly leads to the dimly lit tombs of Mumtaj and Shah Jahan. There was a tunnel to go underground where the actual tombs are, but it remains closed now and we can only see representations in the top. The marble here is translucent, as demonstrated in the transilluminence test at a corner by me and many others. There are glass doors everywhere with small round glass arranged like honeycomb on them. People trying to write their name on this glass had broken several of the comb compartments already. We came outside and sat on the marble and under the shade of the marble mausoleum for a while. Yamuna brought breeze. After collecting our shoes and calculating how much money the shoe keeper would get as "happiness allowance", we walked through the less busy side road into the Taj Museum. We went to the toilets in one corner which is free for foreigners (payback for paying so much to enter) and well maintained. Displayed on the wall outside till the exit, are pictures of various monuments in India pretty many of which I'm yet to see. While exiting, I couldn't fail to notice the awe and wonder on the face of people who were entering then and getting their first glimpse of the Taj. Once outside we had to rush to our car escaping from the e-carts, rickshaws, and camels. And then through the waste-filled gullies of Agra to the inter state bus terminal where we would catch a fast bus that plies on the Yamuna express way to Noida.